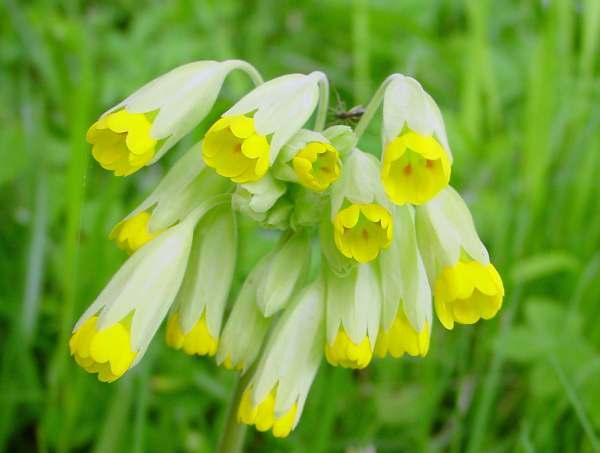 The Cowslip is one of our best-loved wildflowers, and in addition to its beauty it has a wonderful scent. Cowslips begin to produce their first pair of rolled-back leaves in early spring. As they and several subsequent young leaves develop they unroll and begin to look very similar to Primrose leaves, equally wrinkled, although shorter and rounder. The big difference is that Cowslip leaves form rosettes that lie almost flat on the ground. From the centre of the leaf rosette a flower stalk up to 25cm tall arises, at the top of which several individual short-stalked flowers spring from a single point to form a pendent umbel. The number of flowers in an umbel is very variable, but a typical mature plant in suitable habitat might produce a cluster of 10 to 30 elongated bell-shaped flowers, each 8 to 15mm across. Most Cowslips have yellow flowers, but very occasionally, as seen below, you may also come across red-flowered Cowslips in the wild. Cowslips are found in most parts of Northern and Central Europe. For example Slovenia is particularly rich in members of the family Primulaceae, having Oxlip, Common Primrose and Bird's-eye Primrose, too. Appearing a little later than Primroses but overlapping their blooming period, Cowslips are among the best known of the spring wildflowers. In many parts of Northern Europe you will see fields and roadside verges swathed in bobbing Cowslip heads in April, May and June. Slightly alkaline to slightly acid soil seems to suit Cowslips best, but they do need plenty of light and do not thrive in woodlands except beside tracks or in clearings. In meadows these plants areeasily destroyed by over-cropping of the grass in spring. 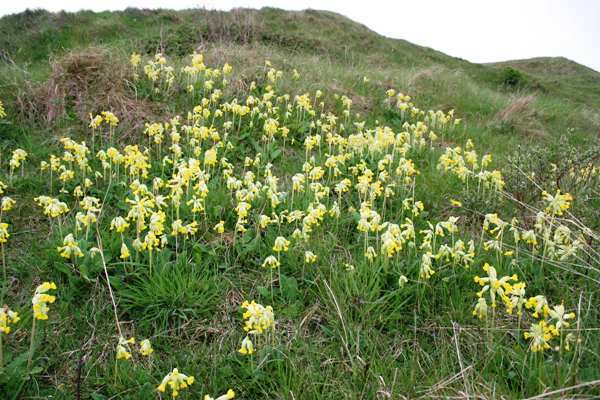 Cowslips can occur in vast colonies once they are settled into a suitable habitat, such as steep motorway banks and roadside verges, provided the land remains largely undisturbed during the growing and flowering season.. This lovely wildflower is greatly prized for its perfume, and so not surprisingly it is used in the perfume industry. The flowers are also collected to make cowslip wine. Cowslips are pollinated by insects. They are the larval host plant for the rare Duke of Burgundy butterfly, as well as an important nectar source for bees and many other kinds of insects. In his Species Plantarum (1753), the Famous Swedish biologist Carl Linnaeus adopted a broad species concept, recognising the Cowslip, Oxlip and Primrose as one species, Primula veris, with three varieties - var. officinalis, var. elatior and var. acaulis covering the Cowslip, Oxlip and Primrose respectively. 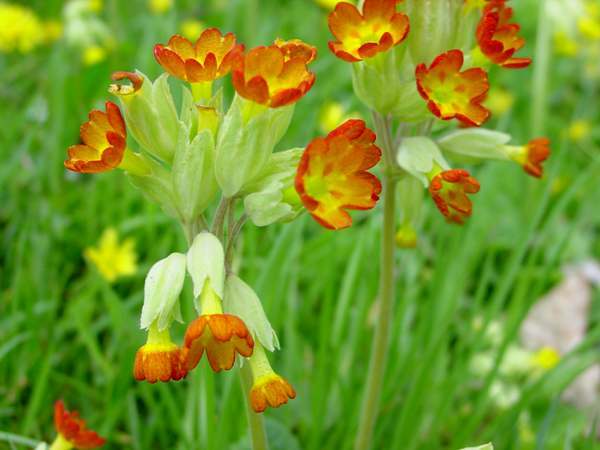 Linnaeus is, however, formally credited with establishing the scientific name of the Cowslip as Primula veris. The common name Cowslip may come from cow slop, because these plants can sometimes be seen growing at the edges of well-rotted patches of cow dung. 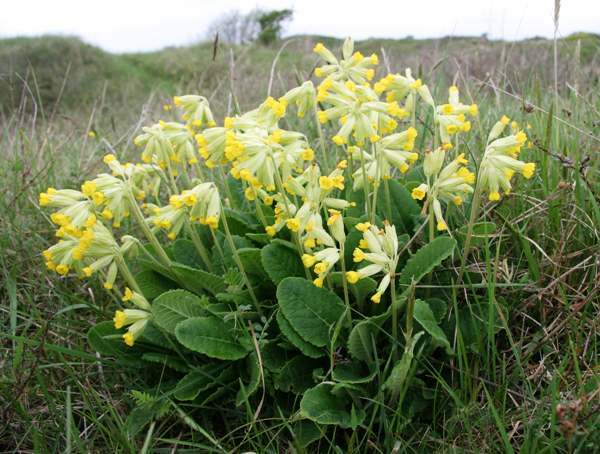 Another suggestion is that Cowslip might a corruption of the Old English Cow's Leak meaning cow's plant. The generic name Primula comes from the Latin Prima, meaning first - a reference to the early appearance of flowers in this genus and Primroses in particular. It is from Latin that we get the specific epithet veris, meaning true. 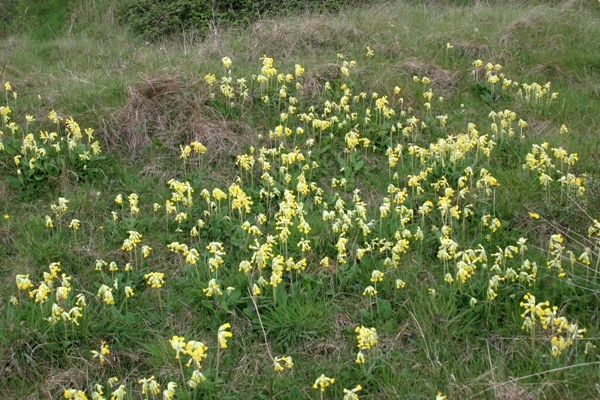 Cowslips hybridise readily with Primroses and other members of the Primula genus. A very common sight in the wild where both Cowslips and Primroses grow is the False Oxlip. There is also a true Oxlip, Primula elatior, but these are not common in the UK. Primula elatior occurs more commonly in some parts of Eastern Europe, and on field trips we have seen and photographed them in Bulgaria. Primroses Primula vulgaris are sometimes mistaken for Cowslips. Preston, Pearman & Dines (2002) New Atlas of the British Flora. Oxford University Press.